Mango mania to kick off the summer! Juicy mangoes are a fruit that have been enjoyed for over 3000 years now! In India, they are renowned for bringing good luck; people even tie dried mango leaves outside their homes. The art of gifting the best quality mangoes is not just an Indian but a global tradition. Summer is here and so are the delicious mangoes! 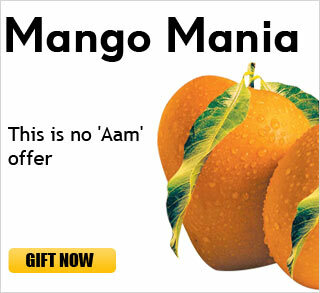 The tradition of gifting tasty mangoes has been carried out throughout the ages. This summer, Tajonline brings to you the best quality Alphonso mangoes at the lowest prices in varied quantities like 2 dozen which are deluxeAlphonso mangoes or mango peti which is grand, with 4 dozen mangoes to suit your choice. ← The Great Indian Jewellery Festival, exclusively for you!